15 players from the British Virgin Islands Rugby Football Union are in Hong Kong to compete in the 14th annual Kowloon RugbyFest 2015, also known as the Kowloon 10s. This is the second time the BVI Rugby Football Union has competed in the Kowloon 10s. On March 25, the team played against five other teams from Australia, Hong Kong and Malaysia and advanced to the semi-finals. The team barely missed winning in their sixth game to advance to the finals when, with less than 30 seconds left on the clock, the opposing team, The Dirty Frogs, a composite Asia team of players from Thailand, Malaysia, Indonesia, Vietnam, Singapore and Hong Kong, scored. The BVI Team said they were proud to have progressed further this year and were upbeat even after a full day of intense competitions. Last year at the 13th Kowloon 10s Tournament, the team won three games in the first round and was thrilled to also be awarded “The Most Social Team”. 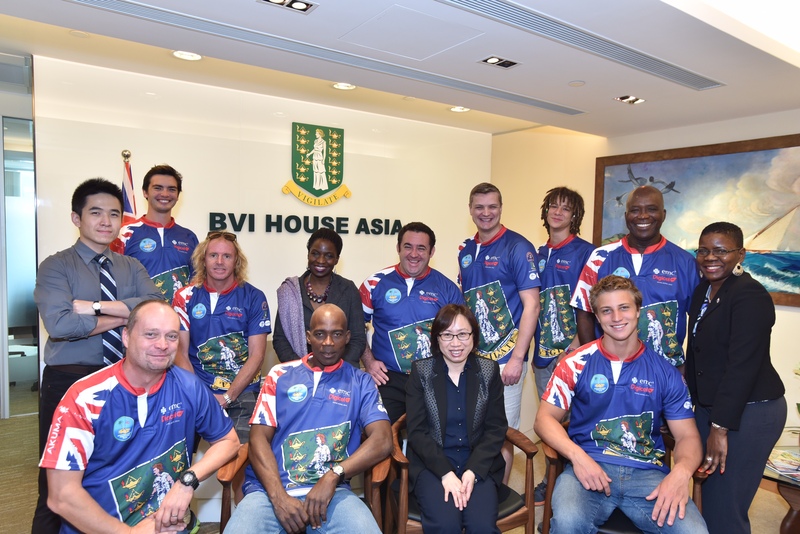 After the daytime competition, the BVI Rugby Team joined the ritual Kowloon RugbyFest dinner in the evening, which was partially sponsored by BVI House Asia. Over 600 guests attended, including a number of rugby legends, for an evening of celebrations and social banter. The BVI Rugby Team was also sponsored by Digicel BVI, Pussers Rum, Walkers, EMCS, and Chrys Global. RugbyFest, better known as the Kowloon 10s, began in 2001 to embody the true spirit and camaraderie of the beautiful game, complementing the more competitive Rugby Sevens. The first Kowloon 10s competition took place in 2002, and has since become an integral part of Hong Kong’s week of rugby, visited by teams from all over the world, such as the BVI. The BVI Rugby Football Union is a non-profit organization that started when a group of British, South African and Australian expats living in Tortola, BVI, formed a team and played against a group of Royal Navy engineers. Today, they have grown to a team of 50 active players residing in the BVI from 11 different countries. As a non-profit, all proceeds go to the Youth Development Program in the BVI, a program that has been running for eight years to teach rugby and development skills to currently 400 students from 10 schools. The BVI Rugby Football Union strives to promote rugby and its values within and outside of the BVI, particularly to the younger generation. Outside of the Kowloon 10s, the BVI Rugby Football Union faces off against the Royal Navy twice a year as they pass through the BVI. The team also makes its annual pilgrimage to Trinidad to compete, and work in another two additional tours per year to other Caribbean rugby nations, such as Barbados, the Dominican Republic, and Jamaica.